This floppy ground coverer comes from southern Mexico. It is frost tender and I don’t think would like drought. Flowers are in winter and are red. I don’t think it would be hard to get rid of if you decided it was taking over. It layers where it goes so there are always new plants coming on. 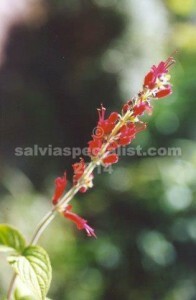 Perhaps the closest salvia is scutellariodes which is also ground covery but beautiful blue flowers.